There can be no doubt you live in a world filled with voices each claiming to be the Word. But as you search for me your Loving Savior you must listen to your heart not with your ears. The voices you hear with your ears may sound convincing but they are not authentic. External voices come with a quick fix plan that circles the difficulties and adversity’s pounding in your life but they will lead you nowhere. Many years ago through the prophet Jeremiah I spoke the following message in the heat of my people that message is for you as well. 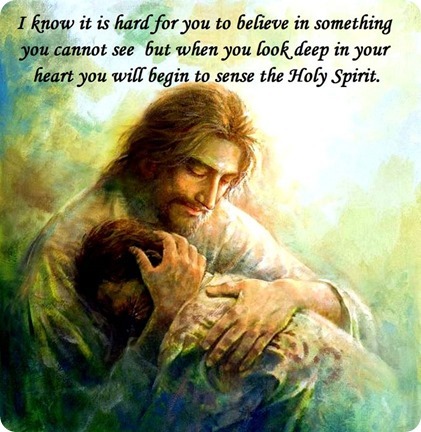 I know it is hard for you to believe in something you cannot experience with your 5 senses but when you look deep in your heart and get serious about having a relationship with me so my plans can come together in your life you will begin to sense the Holy Spirit. It is the Holy Spirit that speaks to your heart all of my messages to you. Do not see your doubts as a lack of faith instead see them as a stairway into the depths of my heart. You may think you are chained to the difficulties and adversities now holding and choking you but I have freed you from them. I have so many blessings to give you, not just external blessings but spiritual blessings and even eternal blessings as well. Jump into my arms and I will catch you and I will carry you until you can walk beside me yourself.